This long-established surname is of Anglo-Saxon origin, and is either a topographical ame from residence by a muddy wood, deriving from the Olde English pre 7th Century "horh", mud, slime, and "wudu", wood, or a locational name from any of the various places thus called. These places include: Horwood, north east of Bideford in Devonshire, recorded as "Horewode" in the Domesday Book of 1086, and as "Horwude" in the 1198 Pipe Rolls of that county, and the parish and village of Horwood near Winslow in Buckinghamshire, noted as "Horwudu" in the Anglo-Saxon Chronicles, dated 792. The ancient country manor, Horwood House, is in this parish. In the modern idiom the surname can be spelt as Horwood, Horsewood, or Howood. Locational surnames, such as this, were originally given to local landowners, and the lord of the manor, and especially as a means of identification to those who left their birthplace to settle elsewhere. Early examples of the name include: William de Horwode (Kent, 1273); Alex de Horewod (Buckinghamshire, 1273); and William del Horewode (Staffordshire, 1332). On March 23rd 1566, Willyam, son of Christofer Horwood, was christened at St. Mary's, Aylesbury, Buckinghamshire. James Howood, aged 30 yrs., and an early emigrant to the New World, embarked from London on the ship "Christian" bound for New-England in March 1634. A Coat of Arms granted to the Horwood family is a black shield with three ermine bars, cotised gold, the Crest being a crow, wings expanded, pierced through the breast with an arrow, point upwards. Osbert de Horwude, 1214, in the "Curia Regis Rolls of Hampshire", King John, known as "Lackland", 1199 - 1216. 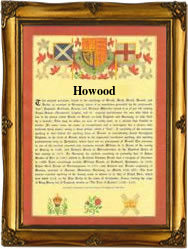 The first recorded spelling of the family name is shown to be that of Horwood which was dated T during the reign of his long-established surname is of Anglo-Saxon origin, and is either a topographical Surnames became necessary when governments introduced personal taxation. In England this was known as Poll Tax. Throughout the centuries, surnames in every country have continued to "develop" often leading to astonishing variants of the original spelling. name from residence by a muddy wood, deriving from the Olde English pre 7th Century "horh", mud, slime, and "wudu", wood, or a locational name from any of the various places thus called. These places include: Horwood, north east of Bideford in Devonshire, recorded as "Horewode" in the Domesday Book of 1086, and as "Horwude" in the 1198 Pipe Rolls of that county, and the parish and village of Horwood near Winslow in Buckinghamshire, noted as "Horwudu" in the Anglo-Saxon Chronicles, dated 792. The ancient country manor, Horwood House, is in this parish. Locational surnames, such as this, were originally given to local landowners, and the lord of the manor, and especially as a means of identification to those who left their birthplace to settle elsewhere. Early examples of the name include: William de Horwode (Kent, 1273); Alex de Horewod (Buckinghamshire, 1273); and William del Horewode (Staffordshire, 1332). On March 23rd 1566, Willyam, son of Christofer Horwood, was christened at St. Mary's, Aylesbury, Buckinghamshire. James Horwood, aged 30 yrs., and an early emigrant to the New World, embarked from London on the ship "Christian" bound for New-England in March 1634. A Coat of Arms granted to the Horwood family is a black shield with three ermine bars, cotised gold, the Crest being a crow, wings expanded, pierced through the breast with an arrow, point upwards. Osbert de Horwude, 1214, in the "Curia Regis Rolls of Hampshire", King John, known as "Lackland", 1199 - 1216.